ARS (Automobili Sportive Romana), created by Bruno Patriarca in 1963, this car was constructed in only single example. 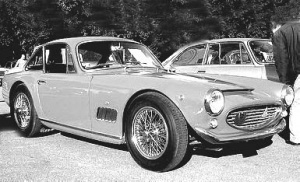 In 1963, the Roman engineer Giulio Pasquale Coluzzi to celebrate his fifty Birth Day, he thought of giving himself a car. But not anycar; his car had to be unique. Coluzzi then filed the marque name ARS, which stands for "Automobili Sportive Romana," said Giannini brothers draw from their workshop in Magliana, using mechanicals from Alfa Romeo Giulietta and Alfa Romeo Sprint Speciale, and the frame was turned by Bruno Patriarch considered the best designer in the capital (Roma). The engine was bored out to 1481ccm with an output of 110hp. He wanted the body of the ARS-U1, where U stands for a single copy, to be made of steel. In the sixties in Rome only Angelo and Enzo Filacchioni, expert panel beaters, could best achieve the desires of the engineer. Today the beautiful car, license plate 673546 Roma, still running on the streets of Rome. Red 'on' with its lines low and streamlined, at first sight "U1" may seem like a small Ferrari 250 GT SWB. Engine: 4 cyl. Alfa Romeo bore/stroke 79,4x75-1481ccm 110hp at 6500 rpm. with twin Weber's.